I have some exciting news!!! Next month I will be joining along in my first quilt-a-long. There is no hiding that my family loves the classic video games. My first patterns that I started to design was Mario Inspired Characters. Well Tetris would be another one of those beloved classics. 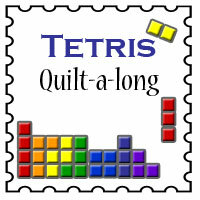 Melissa over at Happy Quilting is going to be running a Tetris Quilt-A-Long starting in mid July. You can find the link over in my blog hop buttons. I am so excited to be joining a long in this event. Like I said this will be my first quilt along, so I have to admit I am a bit nervous...... However that is not the only cool Tetris news I have to share. Week 1-12 each week we will make 1 -7 in by 7 in square for a total of 12 squares. Weeks 13 & 14 we will work on the border edging and to finish catching up for anyone behind. Also everyone that participates will receive the pattern for free as the sections are released. However if you do not participate then after the Crochet-A-Long you will then need to purchase the pattern in one of my shops. After the Crochet-A-Long is finished the links to the pattern will be deleted. I am very excited in doing both events. I know my family is excited to get both a quilted and a crocheted version of our beloved Tetris Game. If you would like to join in on the Tetris fun make sure you become a follower so that you can get updates when the first pattern will be released. I will be releasing the rest of the details as we get closer to the start of the event! Here is the Linky Button to share on your page.